Victoria is known for museums, historic sites, adventure, shopping, and childrens museums. 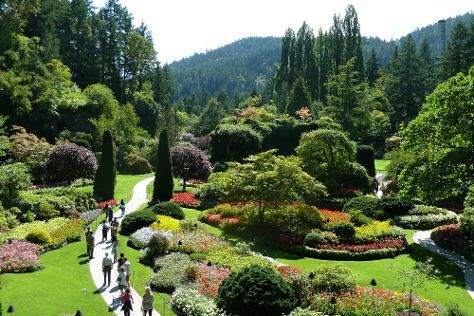 Your plan includes some of its best attractions: admire the natural beauty at The Butchart Gardens, take a stroll through Beacon Hill Park, meet the residents at Victoria Bug Zoo, and get to know the fascinating history of Inner Harbour. To see more things to do, ratings, other places to visit, and more tourist information, use the Victoria trip itinerary tool . Chandigarh, India to Victoria is an approximately 18.5-hour flight. You can also fly; or do a combination of flight and bus. Due to the time zone difference, you'll gain 13 hours traveling from Chandigarh to Victoria. Expect much colder temperatures when traveling from Chandigarh in December; daily highs in Victoria reach 7°C and lows reach 3°C. Finish your sightseeing early on the 27th (Thu) so you can fly to Vancouver. Vancouver is known for parks, nature, zoos & aquariums, museums, and fun & games. Your plan includes some of its best attractions: tour the pleasant surroundings at Stanley Park, take in the awesome beauty at Grouse Mountain, take a stroll through Gastown, and take in panoramic vistas at Vancouver Lookout. For traveler tips, photos, maps, and tourist information, you can read our Vancouver trip planner . Getting from Victoria to Vancouver by flight takes about an hour. Other options: do a combination of ; or take a bus. In December in Vancouver, expect temperatures between 7°C during the day and 2°C at night. Finish your sightseeing early on the 31st (Mon) to allow enough time to fly to Whistler. Whistler is known for winter sports, adventure, nature, spas, and museums. Your plan includes some of its best attractions: take your sightseeing to a higher altitude at Whistler Blackcomb, browse the collection at Whistler Public Library, get engrossed in the history at Squamish Lil'wat Cultural Centre, and kick your exploration up a notch at some of the top local zipline courses and adventure parks. To find reviews, traveler tips, photos, and other tourist information, read our Whistler route tool . Fly from Vancouver to Whistler in an hour. Alternatively, you can drive; or take a shuttle. Expect little chillier temperatures when traveling from Vancouver in December; daily highs in Whistler reach 0°C and lows reach -6°C. On the 4th (Fri), you'll travel back home.